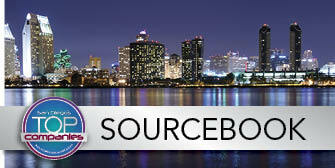 Welcome to the new San Diego SourceBook - where you can search through San Diego's top business lists, find executives and contact information, compare company sales and sizes, and quickly look up related news, videos and competitors. You can even sort the lists any way you want, and download the dataset you need. New lists and companies are being added every day. Please email contact@sddt.com to include your company's message, add your company to a database, or receive more information about being included in the SourceBook.